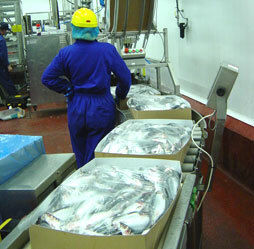 The packing environment for fish can be very harsh and our packaging must perform in conditions of extreme temperatures combined with excessive moisture. We have extensive experience in fish packaging and have a wide range of products to meet your requirements or we can make products tailor made to your own specifications. We also supply cartons in 3 and 6 kilo weights which again are manufactured from PE Lined water resistant material and are approved by Seafish Authority and Iceland Air for transportation of fresh fish for supply into supermarkets. These cartons are again pre glued but are of a leak-proof construction to ensure there is no contamination caused by melt water in combined food product deliveries into supermarkets. 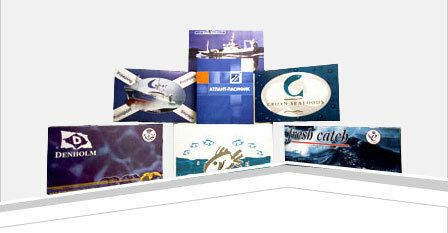 We are the largest supplier of blast freeze cartons into the Scottish Mackerel and Herring fish processing industry. We supply cartons in 10 and 20 kilo sizes which are supplied either plain or printed and are always available from stock. We have worked very closely with our customers and Optimar (Formerly Odim & MMC) to ensure our packaging works efficiently through their carton erectors and lid applicators which is critical during the high volumes seasonal peaks where processing can be 24 hour. Over the last 10 years, company and brand identity has become more important and we have worked closely with our customers to create print designs to reflect their commitments they have to both their products and customers. What ever your product we are confident we can help you choose the right packaging to safely transport, protect and promote your products.